Find Monmouth Beach homes for sale. Call 732-598-7700 to see the Monmouth Beach homes. The Monmouth Beach homes for sale in fall into three categories. Most homes are detached single family homes. The homes are upscale homes, prices are usually starting at $500,000 and up. In fact, you can easily spend well over $1 Million on homes in Monmouth Beach. Homes for sale can also be in one of the four high rise buildings. These homes can also sell for over $1 Million but some can be purchased at times for under $500,000. Monmouth Beach occupies 1 square mile, in an area bordered by the Atlantic Ocean to the east, and the Shrewsbury River to the west. The proximity to NJ Transit trains, buses and the NYC ferry make Monmouth Beach an excellent location for commuters. Many of the homes are detached, single family homes. There are also some condo complexes in town. Also in town are three high rise buildings. Monmouth Beach offers both fishing and waves suitable for surfing. Sailing, kayaking and fishing are also popular on the Shrewsbury River. Additionally, there are two beach clubs are within Monmouth Beach. 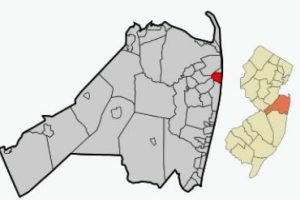 As of the United State Census in 2010, the homes in Monmouth Beach had a population of 3279. The 1494 households had a median household income of $94,583. Students in grades K-8 will attend Monmouth Beach School, while high school students will attend Shore Regional High School. This regional high school serves students Monmouth Beach, Sea Bright and Oceanport in addition to West Long Branch. Students also have the opportunity of attending the Monmouth County Vocational School District. Monmouth Beach is an attractive destination for commuters because it’s near the trains to New York. Additionally, Academy Bus offers service to Manhatten. In addition, the Sea Streak ferry route to Manhatten is a 5 minute drive away. Call 732-598-7700 today to see Monmouth Beach homes for sale.